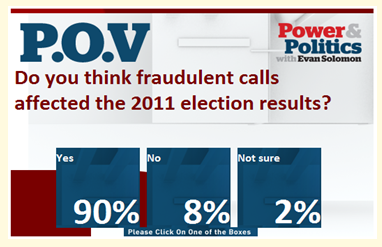 The Twain Shall Meet: 2012 Canadian Election Crimes ~ Silly Conservatives ~ Three Strikes ~ You're Out! 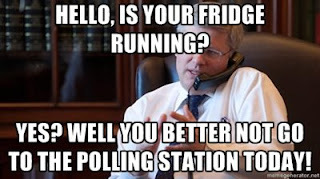 2012 Canadian Election Crimes ~ Silly Conservatives ~ Three Strikes ~ You're Out! Have Conservatives Cheated in a Third Election? Once again, the Conservatives have been caught in a scheme that they are going to be calling "Voter Suppression." I will be using harsher words. But it will all come down to the words we use. OK, two hours into the story and yes, there he is, that familiar Reform riddle and odd artefact, Pierre Poilievre of "Administrative disputes" and Contempt hearing fame. They dug him out of hiding to give us his robotic polemic and tiresome mumbologue. Poilievre repeated today about eight times: "We ran an ethical Campaign and a clean campaign. We do not believe in 'voter suppression'. If we find out who did this they will face the full force of the Law. Bull kent Mr. Polyester. This was not voter suppression any more than the "In and Out" was an administrative dispute. It spite of Poilievre's pitiful claims to frame that Election crime as such. He in fact said it almost a hundred times in Public and obviously many more in rehearsal. Sorry Pierre, It was voter fraud, organized in 18, and now they are saying 27 ridings. Only 'known' opposition voters were called by an automatic dialling system. They were told that they were being called by elections Canada and that there was higher than normal turnout and that they had been re assigned to another polling station. That other station did not exist. Harassing or misleading automated campaign phone calls have been linked to a company (RackNine from Edmonton Alberta) that did campaign work for Conservative candidates, including Prime Minister Stephen Harper. "The NDP is calling for a full-scale investigation into a dirty-tricks campaign apparently aimed at suppressing the Liberal vote during last spring's election campaign. Interim Liberal Leader Bob Rae says the whole Conservative approach to politics should be scrutinized. Interim NDP Leader Nycole Turmel says the tactics are a disgrace and those responsible must be held to account. "Cynical, old-style politics have become a trademark for the Conservatives," she said." This was an obvious conspiracy of some sort and anyone who suggests that a scheme this big and this tightly focused could be the work of 'a few good men' is mistaken or lying. and when the perpetrators are found, there will be criminal charges. I've been waiting since it happened on election day to give elections Canada the time it needed to have this issue surface. Pierre, You were the most contemptuous of any of the posse during the Contempt Issue. Full force of the law, eh? You are not the only one who claims to think so. Let's start with this Pat Martin and John MacCallum reaction, and I'll be back! Remember this Name! RackNine! They made the Calls. I'll bet they are busy today! UPDATE: FRIDAY~ CONS FIRE SOMEONE! THE CONS HAVE FIRED SOMEONE! The Cons have run over someone with a BUS! One down and 102 to go! Lol! This will be the end of it from their side of the Story! But we know it took more than one to do this. He would not have had that much info to share. It goes much much farther up. But that will not stop them from saying "there we fixed it." OTTAWA — "Different Parliament Hill media sources are reporting that a Guelph man has left his job with the Conservative Party of Canada in connection with robo-dialling phone mischief in the last election. The Globe and Mail reported Friday that Michael Sona, a Conservative parliamentary staffer who worked on the federal election campaign in Guelph, resigned Thursday evening from his position as Conservative MP Eve Adams' assistant. The Huffington Post, an online new service, asserted Sona was fired but offered no confirmation of that from the party. Sona, 23, was the communications director for Guelph Conservative candidate Marty Burke during last year’s federal election campaign. Attempts to reach Sona, Adams, or Burke for comment Friday have not led to any comment from them. News of Sona’s alleged break from his job with Adams comes days after a Tory robocall scandal erupted. There is no public evidence Sona had any link to the matter,which is being investigated by Elections Canada." It's like saying, We caught that guy.... "Anonymous". 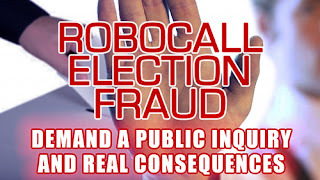 This was not done by a single man it was done by a huge dedicated organization, with a plan and a budget, but if Rack9 Co-operates, any of the little myths that the Cons like to spread, like "calling Election fraud, Voter Suppression, will be laid bare. Stay tuned. The deniability factor slipped a notch when Conservative campaign manager Jenni Byrne denied any connection with the scam, but added that “if anyone on a local campaign was involved, they will not play a role in a future campaign.” Some punishment. Oh, Silly! I don't see any proof of that at all, at least not so far. Do you have some or just this statement? I am OK with that or any other scenario, anyway, as long as it is the truth. It is not what I am getting, having read all that stuff on their site and in the news. Their statements yesterday said that they did not know what was in the messages, they did not deny actually using the auto-dialler. Besides, I don't care what went on at RackNine. Who supplied the names of the 'marks'? So, I am down with that, but to know that you have arrived at the truth, being progressive means 'sources'. The links to RackNine are only there for information. They are at the centre of this at the moment, and that is what you get for dealing with Neo-Cons. The real perps are yet to be outed, although given the recent history of the current regime that it is ^NOT a huge mystery. That outing is very likely inevitable, in spite of the rehearsed mumblings of 'good men' like Pierre Poilievre.